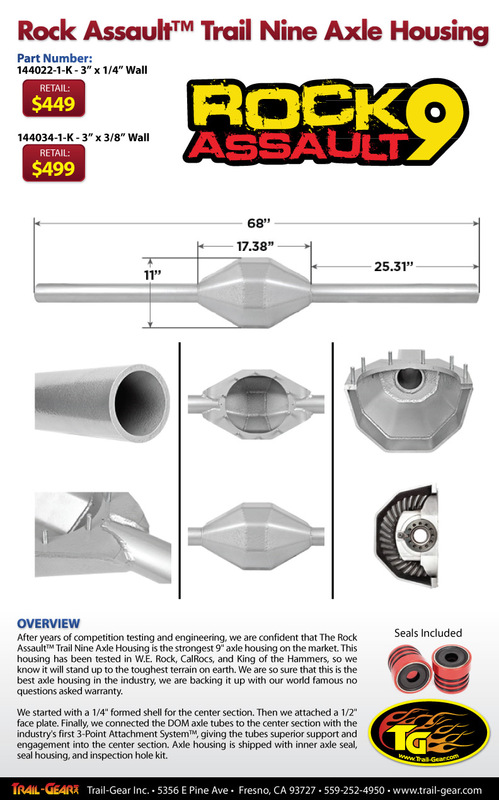 After years of competition testing and engineering, we are confident that The Rock Assault™Trail Nine Axle Housing is the strongest 9″ axle housing on the market. This housing has beentested in W.E. Rock, CalRocs, and King of the Hammers, so we know it will stand up to thetoughest terrain on earth. We are so sure that this is the best axle housing in the industry, weare backing it up with our world famous no questions asked warranty. We started with a 1/4″ formed shell for the center section. Then we attached a 1/2″ face plate.Finally, we connected the DOM axle tubes to the center section with the industry’s first 3-Point Attachment System™, giving the tubes superior support and engagement into the centersection. Axle housing is shipped with inner axle seal, seal housing, and inspection hole kit.